I often feel the same way at the eyepiece. The more I know about what I’m looking through, and what I’m looking at, the more I understand what’s going on and can make meaningful evaluations and comparisons. At a minimum, I like to know what magnification I’m working at, and it is often helpful to know the true field of view (TFOV) and exit pupil (the width of the beam of light entering my eye). So I made a table with all of that information, for every combination of eyepiece and telescope in my inventory, and I keep it on a clipboard with a few other odds and ends. * So if I’m using a 21mm Stratus in my Apex 127, I don’t have to stop observing and do long division to work out the magnification. * Single-sheet all-sky maps of the Messier and Caldwell objects (from here and here), often a tear-out map of the moon or the Milky Way from S&T, and the logbook for whatever project I’m working on. As you can see, my table is a pretty bare-bones affair. I didn’t even give it a title, just left it as “Sheet 1”. And when I got the C102 last week, I just wrote in the additional column by hand. But it’s a crazy useful thing to have along, and if you haven’t made one for yourself, I recommend it. How do you calculate all this stuff? Magnification is telescope focal length divided by eyepiece focal length. So in the XT10 (f/l = 1200mm), the 14mm ES82 gives a magnification of 1200/14 = 86x. True field of view is apparent field of view divided by magnification. It’s important for star-hopping and celestial navigation; if you know that a certain object is two degrees west of a given star, that’s two eyepiece-fields if the EP gives a one-degree field. The ES82s have an 82-degree apparent field, the ES68 and Stratuses have 68-degree fields, the Expanse has a 66-degree field, and the Plossls all have 52-degree fields. In the same example listed above, the 14mm ES82 in the XT10 gives a TFOV of 82/86 = about 1 degree (0.95 to be exact). Exit pupil equals the diameter of the scope’s objective lens or primary mirror divided by magnification. That’s pretty much what magnification is: taking a wide beam of light with a small image scale and turning it into a narrow beam of light with large image scale. To keep using the same example, in the XT10 (250mm diameter) the 14mm ES82 give an exit pupil of 250/86 = 2.9mm. A lot of people, myself included, find that eyepieces become a lot less comfortable to use when the exit pupil gets under 1mm. In contrast, large exit pupils are very comfortable because you can move your eye around a bit without losing the light beam. Most veteran deep-sky observers recommend an exit pupil of about 2mm as the optimum for picking out faint details. This is explicitly a trade-off between brightness and image scale: lower magnifications offer a brighter image but smaller image scale; higher magnifications give a larger image scale but spread out the light so the image is dimmer. The only way to beat that trade-off is to move up to a bigger scope, which will let you have a brighter image at a larger image scale. That’s why aperture matters. I have an Excel workbook that has several spreadsheets in it for Astronomy Calculations. I have the above data and the formulas to automatically calculate the fields, so that I can just copy and paste a new row for a new EP, or one I’m thinking about getting, or a new column for a new scope or a friend’s scope, who asks me questions about EPs. I also have, but don’t use as much any more, an iteration of each set of EPs, a third dimension if you will, that multiplies the values out for using Barlows. 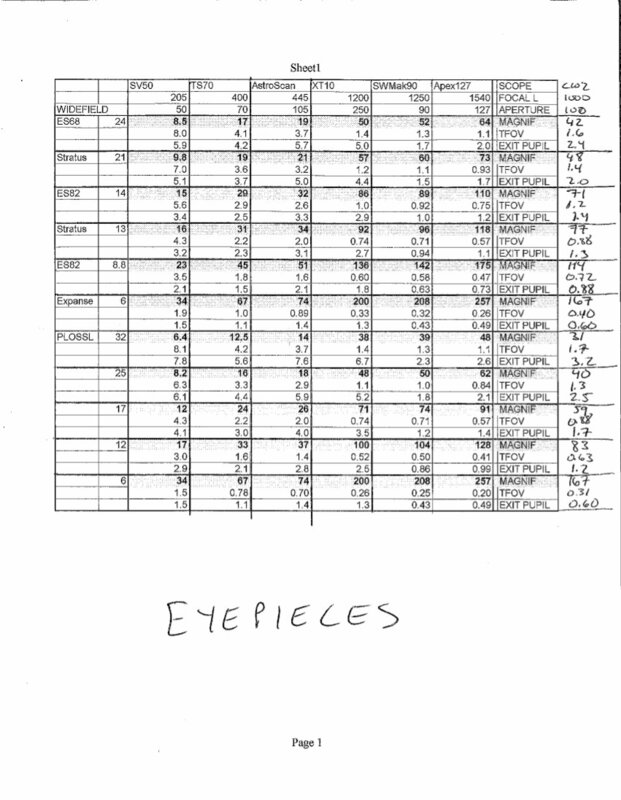 In addition to the above data, I also have several calculation from several different sources that suggest maximum magnification, exit pupil, etc, for a given scope. This helps in choosing what EPs are useful to use or buy. And it color codes the EP data so that EPs that are essentially useless are red and ones near the maximum are yellow. I don’t carry the chart with me, but do look things up before I go out to view.